About a week ago I added to the Support Group Wikipedia page and today I went back to see if what I added was still there and it was not. I’m guessing what I did wrong was add a link that Wikipedia needed to evaluate before they officially add it to their cite. 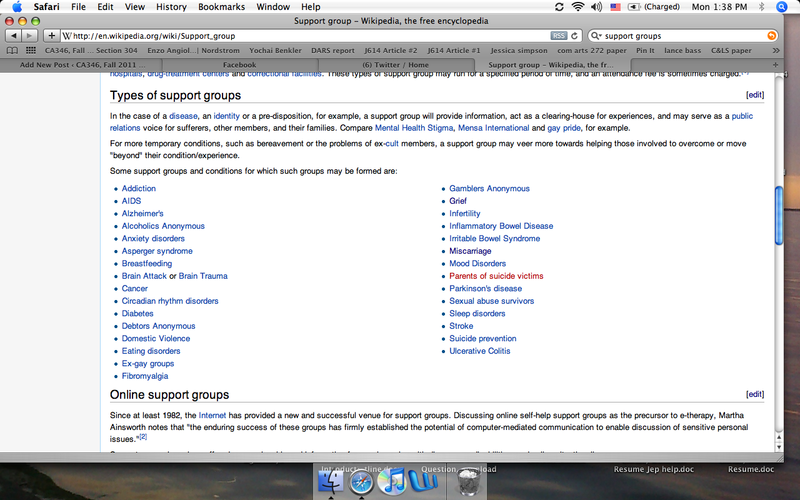 however, i do like the policies they have because otherwise anyone could go messing up pages by adding false information As you can see from this pic there are a number of differnet types of support groups that are listed however, the one that I am focusing on for my project was not (loss of a pet). Even though I tried to add it last week, the formating must have been a little off because what I added was removed 😦 . O well still kind of interesting to try!